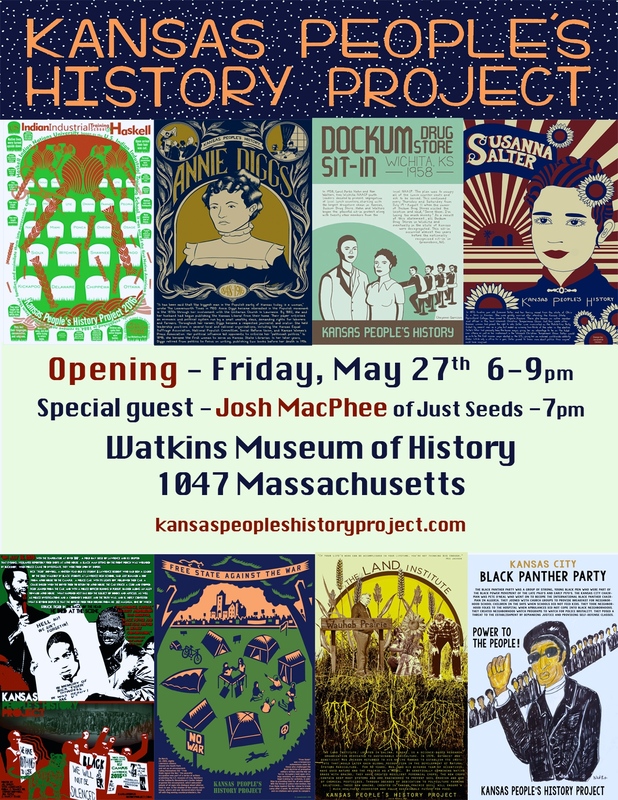 As part of the Kansas People’s History Project, lead artist Dave Loewenstein and printmaker Justin Marable worked with a selection of KPHP poster makers to translate their works into limited edition screen-prints. The thirteen prints are collected in a portfolio, beautifully designed by Marable, that includes a hand printed box and colophon page listing all of the artists. You can see the portfolio as part of the exhibition Hidden Forces showing now through July 17 at the Watkins Museum of History. 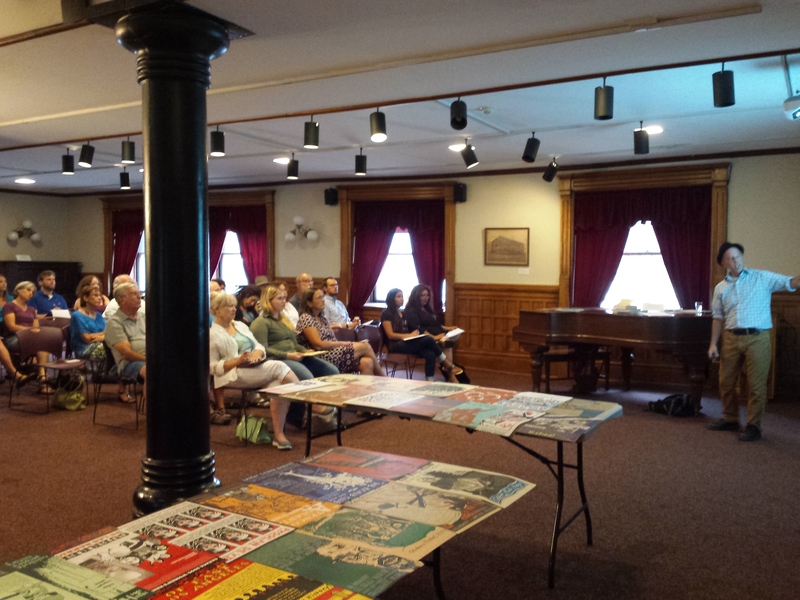 Many thanks to all the folks who came out for the opening of Hidden Forces: The Kansas People’s History Project on Friday. It was a great night. Special thanks to guest Josh MacPhee who spoke to an overflowing gallery of visitors about the origin of the Celebrate People’s History Project (the inspiration for our Kansas project). MacPhee talked about a common cultural affliction – a gnawing belief among many that change just isn’t possible. We take for granted, he said, that the conditions we live with today have always been and always will be. But if we can recall that things aren’t the same as they ever were, that many struggles for human and environmental rights were won throughout history by everyday people working together, then maybe we can imagine ourselves into fighting for change today. This realization, MacPhee said, was the genesis of the Celebrate People’s History project, beginning with one poster in Chicago. MacPhee said that when he began wheatpasting the Malcom X poster on the southwest side of the city, passersby and neighbors approached him asking if they could have posters for their homes and businesses. He realized then that their was great potential in this simple straightforward kind of communication, a poster project that subverted the oppressive environment of advertising, in favor of one that shared knowledge, connection and a sense of possibility. It was a thrill to go down to Pittsburg State this week to give the keynote address for this semester’s Idea Series, and to see the first exhibition to come out of the Kansas People’s History Project. Students in professor Emi Gennis’s typography class worked all semester on poster designs which were displayed along side research material and preliminary sketches. My old friend, professor Josie Mai, curated the show which runs through April 9th. The Kansas People’s History Project is beginning to show fruit! We’ve posted the first 20+ finished posters on our website in the Poster Gallery. Dave will bring limited supplies and will be meeting one on one with folks who have started working on their broadsides. He will also be able to give general guidance to others who are just coming to the project. Broadsides will be due JAN 31, 2016. For more information on the process and design specs, please consult this page or if you have any questions, fee free to email us. • 1. Choose a subject – this can be an individual, group of people, event or other occurrence that you feel has had significant impact at any point in Kansas history (even as recent as yesterday) and that has been under-represented, overlooked or misinterpreted in some way. • 2. Do research on the subject – your research can come from established sources like museums, books and other media but also and equally important are sources that come from your own experience, your conversations with family and friends, and your own digging for information. • 3. Develop a short narrative about your subject – this is a 100-300 word story that captures what makes this person or moment important to you and communicates its significance to a broader audience. • 4. Create or find images to illustrate your story – you can draw, collage, photograph or use any other media to create imagery that illustrates and symbolizes your subject. Even if you choose not to make the illustration, you can collect visual material that will help the artist you will eventually collaborate with. Dave Loewenstein will be returning to original workshop locations in November 2015 to do hands–on workshops that will help with final visuals and summaries. • 5. Design your broadside on your own or collaborate with another artist or citizen historian – this means integrating your short story with the visual imagery/illustration to create your final piece. Your completed broadside should be 11” x 17” inches in a vertical format. You can use two (2) colors plus the color of the paper, which will range in pale shades across the color spectrum. More specific specifications for how to submit your work will be posted soon. If you have questions about how to prepare your poster to be screen printed, please contact us! Kansas has remarkable stories, but many of them are not widely known or taught in our schools. The Kansas People’s History Project (KPHP) will begin to address this gap by making history present and visible in our everyday lives. 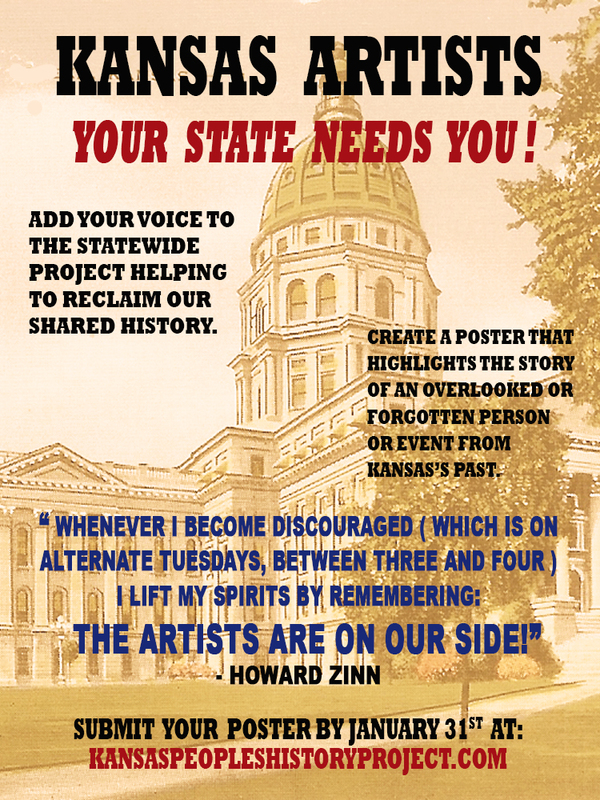 Inspired by Howard Zinn’s groundbreaking book “A People’s History of United States” which examined history “from the bottom up,” the KPHP will focus on the creation of a series of screen printed broadsides with text narratives, a comprehensive website, and an exhibition that shine a light on lesser known but greatly influential figures and events from Kansas’s past. 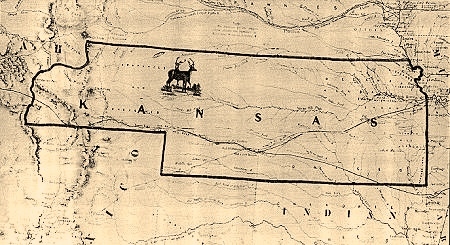 The Watkins Museum of History in partnership with five arts-based and educational organizations from across the state (Pittsburg State University, La Casa de la Semilla in Wichita, Bethel College in Newton, Haskell Indian Nations University in Lawrence, and the Salina Arts Center), will collaborate with lead artist Dave Loewenstein, printmaker Justin Marable and artists from across the state to unearth these lost or underrepresented subjects. 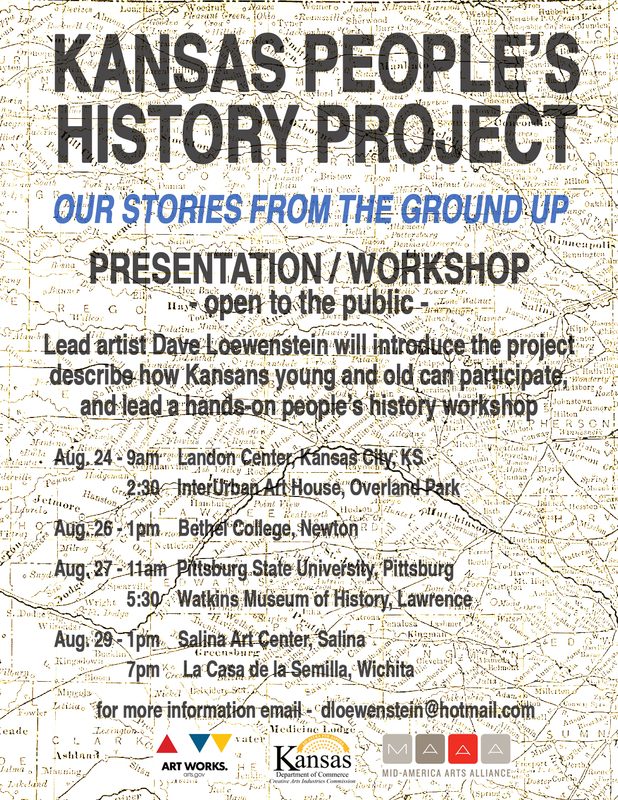 To kick-off the project, Loewenstein will be touring the state August 23-29 leading people’s history workshops for those interested in participating. Scheduled sites include, Salina, Wichita, Newton, Pittsburg, and Lawrence with more to be added soon. To find out more, contact Dave Loewenstein at dloewenstein@hotmail.com.